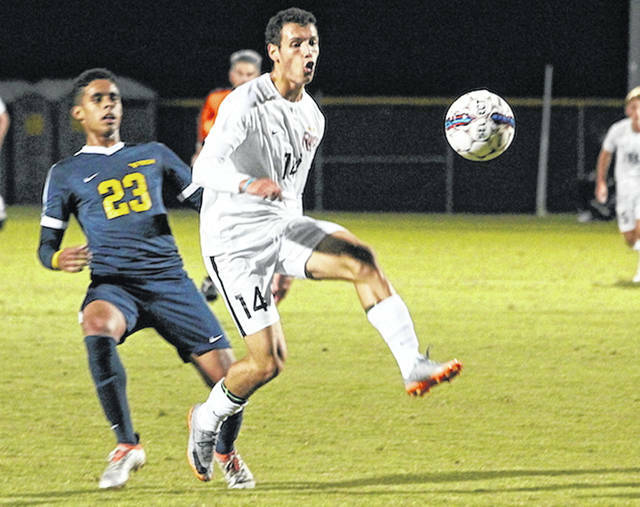 Rio Grande’s Nicolas Cam Orellana scored the first of the RedStorm’s three goals in a 3-1 win over West Virginia University-Tech on Oct. 11 at Evan E. Davis Field in Rio Grande, Ohio. MIDDLETOWN, Ohio — The University of Rio Grande swept all individual honors, while having eight players recognized on the 2018 All-River States Conference Men’s Soccer Team. The all-conference teams and award winners – which were determined through balloting of the league’s 10 head coaches – were announced Saturday afternoon by conference officials. Rio Grande placed six representatives on the 14-player first team on two more on the 14-player second unit. In addition, the RedStorm produced all five individual award winners. Senior defender Mitchell Osmond claimed RSC Player of the Year and RSC Defender of the Year accolades, while freshman forward Nicolas Cam Orellano was named both RSC Offensive Player of the Year and RSC Newcomer of the Year. Head coach Scott Morrissey also garnered RSC Coach of the Year honors. Osmond, a center back from Sydney, Australia, spearheaded a RedStorm defense which is tops in the nation. He controls a back line which allowed just two goals entering Saturday’s RSC Tournament final against WVU-Tech. The RedStorm has 15 shutouts on the season and ranked No. 1 in the country with 0.12 goals allowed per game. Cam Orellano, a native of Santiago, Chile, leads the conference and all newcomers on the year with 20 goals and 44 points. He is 10th in the NAIA in total goals and goals per game (1.18) and 13th in points. Morrissey, who is in his 30th year as RedStorm head coach, has orchestrated another undefeated conference season and has pushed Rio Grande to the No. 1-ranking in the country. Rio’s six First Team selections include Osmond, Cam Orellana, senior forward Harry Reilly (Coventry, England), senior midfielder Eduardo Zurita (Sant Boi de Llobregat, Spain), junior defender James Williamson (San Jose, Costa Rica) and junior goal keeper Richard Dearle (Castle Donington, England). Reilly is ranked in the top six nationally in three categories – assists per game, total assists and points per game. He has 11 goals and 15 assists for the season. Zurita has 14 goals and nine assists heading into Saturday’s game, while Williamson has four goals and six assists and Dearle had recorded 13 shutouts. Rio also placed sophomore midfielder Ewan McLauchlan (Aroch, Scotland) and freshman midfielder Joe Quayle (Isle of Man, United Kingdom) on the second team. McLauchlan has four goals and three assists, while Quayle has one goal and one assist for the season. WVU-Tech also totaled eight all-conference selections, with three on the first team and a conference-high five on the second team. The Golden Bears’ three players placed on the first team included Jesus Naves (Jr., F), Sergio Sanchez (Jr., M) and Eduardo Gutierrez (Jr., D). Point Park (Pa.) University and Brescia (Ky.) University put two players each on the first team with Geert Bijl (So., M) and Lorenzo Diaz (Fr., D) representing the Pioneers and the duo of Jean Laurent (Sr., F) and Jacob Stanley (Jr., GK) representing the Bearcats. There were a total of five schools represented on the first team with Midway (Ky.) University’s Callum Kemp (Sr., M) also making the list. After WVU Tech’s five players on the second team, Asbury (Ky.) University was next with four players selected. Rio Grande and IU East had two second-teamers each, and Point Park had one. The River States Conference also named a Champions of Character Team, with one player from each school selected as the team member who best displays the NAIA Champions of Character five core values of respect, responsibility, integrity, servant leadership and sportsmanship. Williamson was Rio’s representative on the list.